Florida Atlantic collapsed down the stretch, losing their last five games to finish 3-9. The Owls should benefit from an early schedule that has the team playing four of their first six games at home. Charlie Partridge takes over at Florida Atlantic, which enters the season on a four-game win streak. Partridge, 40, has bounced around as an assistant in 18 years in the college ranks and he will be tested from the start. The Owls open at Nebraska and follow with a trip to Alabama. After playing host to Tulsa, the team will embark on its longest journey of the season, a Sept. 20 game at Wyoming. Wiz correspondent Greg Laughlin was in Boca Raton on Saturday to see Howard Schnellenberger, 77, coach his final game. Schnellenberger's Florida Atlantic Owls were shut out by Louisiana Monroe, 26-0, and the veteran coach, who also guided programs at Miami, Louisville and Oklahoma, finished with a career record of 158-151-3. Yes, we probably should have run a photo of Schnellenberger to lead off this post, but let's be honest. Our readers would rather see the image posted above. Any complaints? There are images of Schnellenberger after the jump, and you can view Greg's full gallery by clicking here. Howard Schnellenberger has built the Florida Atlantic program from the ground up and his biggest creation yet — a new 30,000 seat on-campus stadium — will open Oct. 15 when the Owls play host to Western Kentucky. What the team will have left at the midpoint is the question. 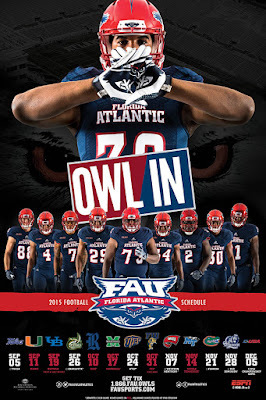 Florida Atlantic plays its first five games on the road, including trips to Florida, Michigan State and Auburn. Click the image to enlarge. Thanks to Dexter. Florida Atlantic playing a "home" game in Detroit? It happens Saturday when the Owls "play host" to Michigan State in Ford Field. The game was originally to be played in Florida Atlantic's new on-campus stadium in Boca Raton, but construction is behind schedule and the facility won't open until next season. Hence the decision to move the game to Detroit, where "Spartans in the D" billboards — paid for by Florida Atlantic — can be spotted around town. 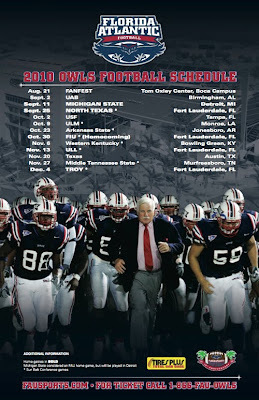 The Owls will play their other four home games at Lockhart Stadium in Fort Lauderdale. Last year, the site displayed 69 posters. This is poster No. 71 for 2010. Thanks to Dexter! 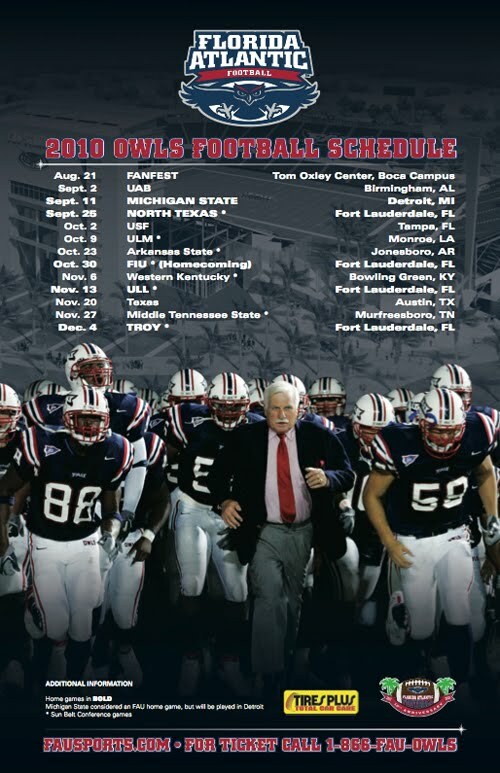 The Owls have three nonconference games of note, starting with the Sept. 5 opener at Nebraska. 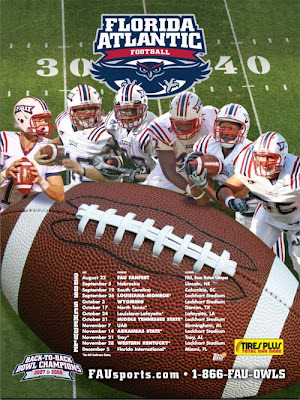 On Sept. 19, Florida Atlantic travels to South Carolina. The Owls play host to Wyoming on Oct. 3. Thanks to Dexter!